Cooper Zeon LTZ and Toyo Open Country AT2 are two of the most popular all-terrain all-season tires. These tires offer exceptional performance for all conditions and situations. They have been designed for comfortable driving not only on a dry asphalt road, but also when the day is raining or snowing. They can also function for mild off-road applications. So, should you go with Cooper Zeon LTZ or Toyo Open Country AT2? 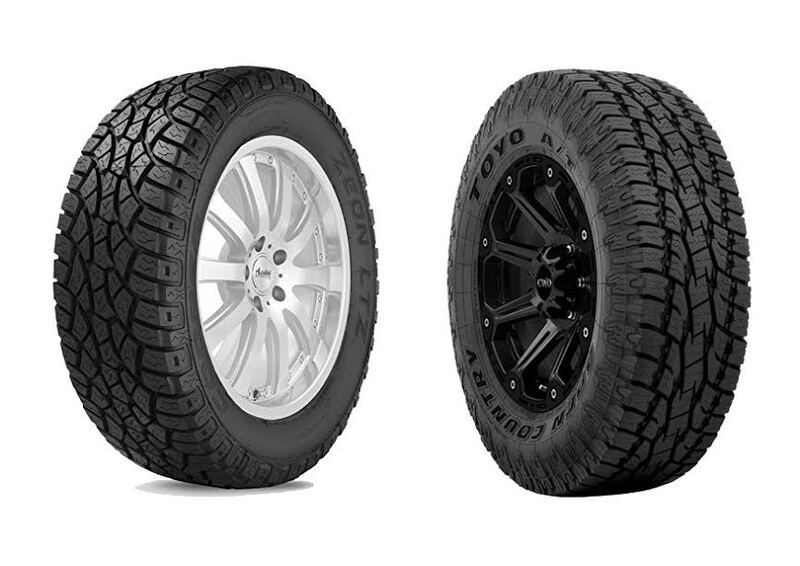 In the following article, we will see how these two great tires compare against each other. Continue reading below. Cooper Zeon LTZ has been designed as a hybrid between an all-terrain performance tire and a sports truck tire. The result is a tire that is not only good-looking but also reliable for various situations. It has an aggressive design that can tame any road surface, providing exceptional ride and handling capabilities. It comes with alternately scalloped shoulder lugs that improve the traction on soft surfaces, such as when going through sand or mud. The lug tie-in zones have raised and serrated lug locks that reinforce the tread pattern for enhanced traction, steering, and durability. And the long “Two Z” element siping creates long and dependable traction in all weather conditions, at the same time also balancing the tread element stiffness for controlled tread wear and handling. Toyo Open Country AT2 comes with an even more aggressive design for maximum performance on the face of any challenge. It comes with an aggressive sidewall, scalloped shoulder lugs, and an open tread block design. It looks though and robust. The tie bars between the block elements help in stabilizing the tread blocks, improving dry braking, and reducing irregular wear. The wear-resistant compound extends the tire life and durability, and the sophisticated deep tread grooves have stone-ejecting blocks that both force stones not to stick on the grooves and enhance the traction on mud and snow. The polygonal blocks and zigzag sipes greatly improve snow performance. Cooper Leon LTZ is actually a very good tire. It especially excels on the road. When driving on the road, you can rely on Cooper Leon LTZ to face any weather. Even when the day is raining or the road is snowy, the tire still delivers great traction and handling. You can confidently navigate through. However, it can only perform for mild off-road applications and not for heavier duties. On the other hand, Toyo Open Country AT2 offers maximum performance for both on-road and off-road conditions. Toyo Open Country AT2 provides excellent steering and handling, and this model is also very quiet. - Long "Two Z" element siping help provide for long, dependable traction in all-weather conditions while balancing tread element stiffness for tread wear and handling. - Cooper Zeon LTZ vs Toyo Open Country AT2. - Stabilizes tread blocks, improves dry braking. - Delivers tough looks and even tougher performance in dirt, mud, or snow, while maintaining a quiet ride. You can choose Cooper Leon LTZ if you only use the tire for on-road purposes. However, for the best performance in different conditions, Toyo Open Country AT2 is the way to go.